Giorgio Vasari, who was born in Arezzo, was a painter and architect, but he is best remembered as an art historian. The second edition of his “Lives of the Most Excellent Italian Painters, Sculptors, and Architects, from Cimabue to Our Times”, which was published in 1568, is still in print (including in English translation). Vasari’s great grandfather had been the uncle of Luca Signorelli. Vasari recollected that Signorelli had “lodged in the house of the Vasari [in Arezzo], when I ... was a little boy of eight years old, [and] I remember that the good old man, who was most gracious and courteous”. Eight years later, Vasari moved to Florence, where Cardinal Silvio Passerini, the guardian of the young Ippolito and Alessandro de' Medici, sponsored his education alongside them. He also studied art there under Andrea del Sarto. The Medici were his patrons throughout his life. Vasari was famously a friend and great admirer of Michelangelo. The two artists were among the founders of the Accademia delle Arti del Disegno in Florence in 1563, with the support of Duke Cosimo I de' Medici. This was the first such institution to be established in Italy. Vasari enjoyed high reputation during his lifetime and made a considerable fortune. The Casa Vasari, which he built in 1547, is now a museum of his life and work. Vasari’s work in Città di Castello was mostly carried out for the Vitelli family, who provided a series of military commanders for the Medici in Florence. ✴frescoes for the “walls of the loggia”. It is generally accepted that Giorgio Vasari provided the initial designs for the monochrome frescoes of this facade (illustrated above). They are usually thought to have been largely the work of Cristofano Gherardi: probably began them during his visit to Città di Castello with Vasari in ca. 1534 and completed them in 1537, by which time the ground floor loggia had presumably been closed. The frescoes on the arch over the street to the left must have been executed after 1543, presumably by another artist. These were largely repainted in 1912. Vasari remodelled this chapel in San Francesco (the 1st chapel off the nave on the left). 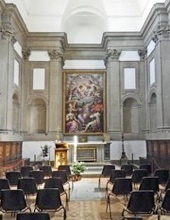 The Fondazione Cassa di Risparmio di Città di Castello financed the restoration of the chapel and its altarpiece (below) in 2004. In his account of his own career in the “Lives of the Artists”, Vasari recorded that: “For Signora Gentilina, mother of Signor Chiappino [Giovanni Luigi Vitelli] and [for] Signor Paolo Vitelli, I painted in Florence and sent from there to Città di Castello, a great altarpiece in which is the Coronation of Our Lady with, on high, a dance of Angels and, at the foot, many figures larger than life, which was placed in the church of San Francesco in that city”. (Chiappino was the son of Nicolò II Vitelli and Gentilina della Staffa. Paolo Vitelli, the son of Alessandro Vitelli and Angela de’ Rossi, was thus his cousin and Gentilina’s nephew.) This panel remains in situ. 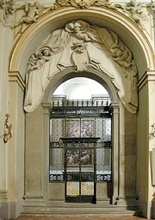 Girolamo Maffei received payments for this tabernacle for the high altar of San Pietro in 1553. There seems to have been some dissatisfaction with its design, and a new design was commissioned from Giorgio Vasari in 1555. In 1559, Girolamo and his brother Giacamo Maffei were commissioned to complete it. It was destroyed in 1680. ✴the feast at Cana (on the left wall, illustrated here). These subjects, which all involve miracles that occurred during meals, were of course appropriate for the original location in the refectory. Return to Art in: Città di Castello Gubbio Perugia.